Line/network echo cancellers are intended to cancel echoes at the near end of the network connection for the sake of voice quality enhancement experienced by the far-end subscriber (cf. Figure 1). There are however situations that deviate from this typical and common provisioning of echo cancellers. One situation is when the far-end echo cannot be cancelled locally and, in such a case, use of a far-end echo canceller is warranted. The far-end echo cancellers (operating at the near end) to control/cancel echoes at the far end of the voice channel are available either as specialized products or as modified near-end canceller solutions. The deployment of far-end echo cancellers is justified only in special or barge-in situations when existing echo canceller located at the far end does not work adequately, or simply is not enabled. Also, in the case of networks comprising of satellite links, far-end echo cancellers may be installed as needed. One of the prerequisites of successful operations of echo cancellers is prior knowledge, at the provisioning stage, of approximate echo path coverage requirements. While typically the bulk delay section is relatively short and does not exceed several dozens of milliseconds (even in the case of VoIP networks where expected signal delays are larger than in TDM networks), it can sometimes exceed 100 milliseconds (the case when the facility housing the echo canceller is geographically remote from the access network connecting the subscriber line to the long-haul network), or, in the case of situations requiring installation of far-end echo canceller, it may even exceed 500 milliseconds. 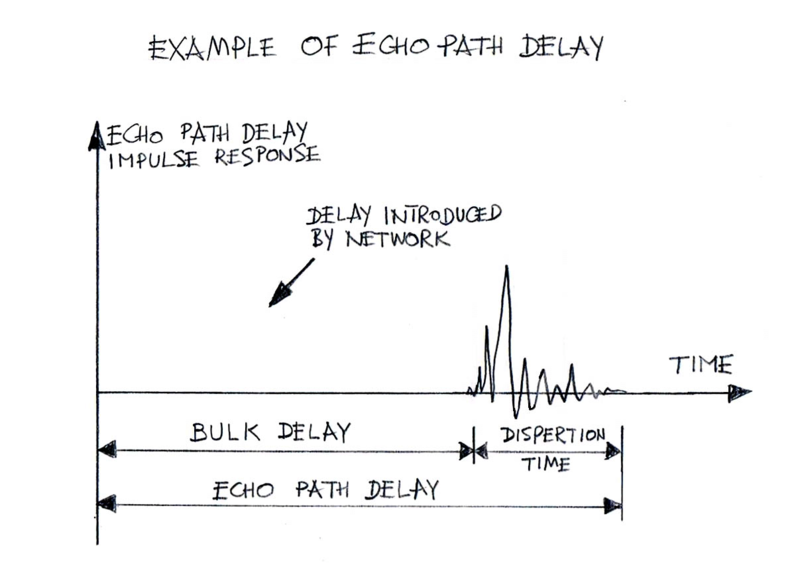 According to an earlier report on North America telephone connection surveys, the largest percentage of dispersion time of echo path delays is between 5–7 milliseconds. Only two calls out of 101 long-distance calls had a dispersion time between 11–12 milliseconds. Note that ITU-T G.168-2012 (and earlier versions as well) includes 8 models of echo path delay models of which the longest is model number 4 whose span is 16 milliseconds. However, the total lengths of the echo path delay impulse responses may be much longer and the echo cancellers, in order to adequately perform in term of cancelling/reducing echoes, have to be provisioned accordingly.